WORD Bookstore hosted Kayla Rae Whitaker for a discussion of her debut novel, The Animators. 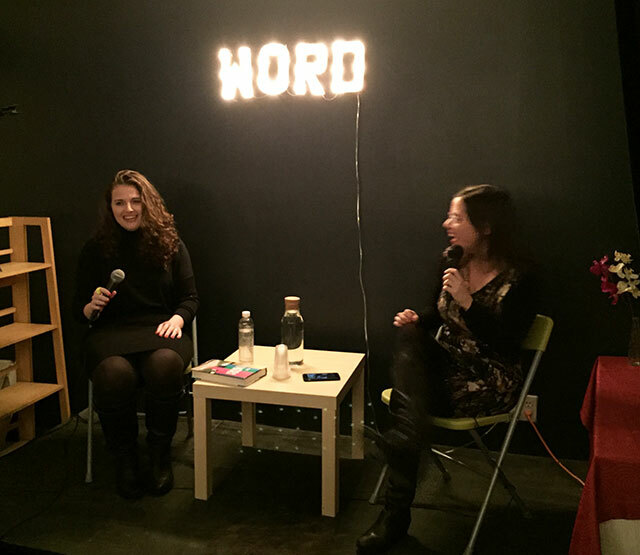 She was joined by Maris Kreizman, author of Slaughterhouse 90210. The Animators follows the friendship of a creative duo, Mel and Sharon who work as animators celebrating the release of their first full-length feature. After a brief prolog introducing Mel and Sharon, the novel skips over the characters’ early career and the awkward years in their twenties. Their lives then were messy, and they were figuring out their creative process, Whitaker explains, indicating that’s how she saw her own late adolescence. Whitaker is not an animator herself, instead calling herself a cartoon fangirl. She watched a huge amount of television, particularly animated shows. As a child, she also noticed that her grandfather, who often watched along with her, would laugh at things she didn’t understand. Soon she realized there cartoons worked successfully on two different intellectual levels. Although she watched plenty of cartoons, she didn’t know much about the animation process. Coincidence helped her along. She was leaving a temp job and her replacement happened to work at Adult Swim, the cartoon programming on late night cable. The replacement was willing to indulge her cartoon fascination. The research didn’t stop there though. She watched lots of videos on line, with YouTube playing a big part. She watched a lot of how-to videos. “YouTube is great, not just for cat videos,” she jokes. As for the construction of the novel, Whitaker prefers to work without an outline. That might be why it took her seven years to write The Animators. She relies on multiple drafts to find out what the story is. The book includes a film within the story, and though Whitaker isn’t an artist, she admits there are some sketches of storyboards of the film laying around. Those sketches provide a basic idea of what the film looks like as a reference point. She also had a clear sense of Mel and Sharon’s aesthetics. She thinks of it as a little bit dingy, like the animated 1970s Lord of the Rings film. Mel and Sharon met as college freshman, both outsiders in a northeast liberal college. Both women are drawn together because they come from less money than the students around them. Mel is exhibitionist and wants to act out, while Sharon is not. The novel is about how their relationships change over time. Mel has no filter with what she says, a trait she admires. “I’ve always been self-conscious,” Whitaker says. Whitaker is from Kentucky, on the eastern side of the state. She and her husband have since moved to Louisville, which is in the west. She describes it as a little blue dot in a red state. One of the things that she found appealing about New York City, and what draws Mel and Sharon to the city, is that it is place everyone is allowed to be themselves. That isn’t necessarily the case in Kentucky. Now Whitaker says that following the election, the veneer that she feels protected her has been cracked. “I feel less safe, I don’t feel safe there,” she says. The feeling of agency and security is threatened. However, Kentucky does have great barbecue and hot chicken. “I really do like southern friendliness,” Whitaker says, and goes onto admit that her grandparents were cousins. Writing about Mel was liberating, Whitaker says, especially when it came to writing about her addictions. Whitaker says that she is also an alcoholic who has since sobered up. It was difficult to write about her own experience because she spent so much time being quiet about it. “It hurts to be vulnerable,” she says. As for Mel’s addictions, Whitaker wanted it to be part of the background of the story, as addiction often is.